The Fiat Linea offers a comprehensive range of excellent engines that feature state-of-the-art engineering and generous performance. The range comprises a Multijet turbodiesel engine (1.3 16v delivering 90 bhp) and two petrol engines: a 77 bhp 1.4 16v, and a 120 bhp 1.4 16v turbocharged engine from the new T-JET family (which will be available after the launch). Each engine offers different advantages, all of which are exploited in full by being combined with 5-speed gearboxes, and they stand out for their generosity, their sparkling character or their excellent performance and sophisticated technology. But all the engines are extremely reliable and environment-friendly. All the engines mounted on the Fiat Linea are manufactured by Fiat Powertrain Technologies, the Group’s new sector. FPT draws together all the activities in the fields of innovation, research, design and manufacture related to engines and gearboxes for all types of applications: from cars to commercial vehicles, boats and agricultural machinery. With approximately 19,000 employees, 17 plants and 10 research centres in eight different countries, the Sector is one of the world’s most important organisations in its field. At FPT, approximately 3000 highly specialised technicians focus on the development and engineering of innovative technologies. More than 40 patents are filed each year, confirming the quality and seriousness of this commitment, and making FPT a huge centre of technological excellence and constant innovation. The new family of T-JET turbocharged petrol engines, which made its debut on the Bravo, will be available on the Fiat Linea, featuring outstanding performance, prompt response to the accelerator, low consumption, constructional simplicity, sturdiness and reliability. Available after the launch, the 1.4 16v turbo engine delivers 90 kW (120 bhp) at 5000 rpm and peak torque of 194 Nm at 1750 rpm. The engine is very elastic, requiring fewer gear changes, for an enjoyable, relaxed driving style, but it will respond assertively if the driver puts his foot down. This is one effect of the low inertia of the turboblower, which makes it possible to obtain top performance by acting on the accelerator, and there are none of the annoying delays typical of this type of engine. The result is outstanding sportiness combined with fuel economy. The outstanding reliability of the engines is guaranteed by the hundreds of thousands of kilometres driven by prototypes during the development stage, in addition to thousands of hours of static and dynamic tests on the bench. The first maintenance is scheduled after 30,000 km, and there is no need for any intermediate servicing. The oil/water heat exchange guarantees these results. The oil filter is of the environment-friendly type. The computerised engine control system manages all the functions using sophisticated calculation algorithms. The accelerator control is of the ‘drive-by-wire’ type, without mechanical connections, so that the driver can obtain the relaxed or sporty response he wants from the engine, without wasting energy. These excellent results have been obtained by painstaking design and development of all the engine components, demanding over 120,000 hours of activity. State-of-the-art computer-assisted design and calculation systems were used, making it possible to simulate the greatest stress caused by the turboblower. All the major components have been re-designed, so that we could describe the engine as completely new. Particular attention was paid to fluid dynamics and combustion, to minimise energy losses and to obtain top performance and low consumption, and the results were guaranteed by sophisticated experimental analysis. This new engine has a capacity of 1368 cc, and 4 cylinders in line, with a bore of 72 mm and stroke of 84 mm. There are four valves per cylinder, activated directly by 2 overhead camshafts. 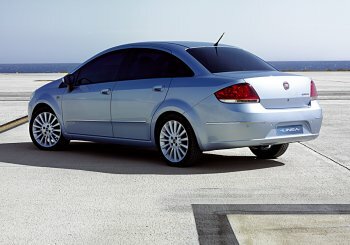 The engine was developed paying particular attention to performance and to fuel economy, two areas in which the Fiat Linea leads its class. The merit goes to the volumetric efficiency which has been optimised all through the operating range, the result of precise fluid-dynamic development of the entire intake system and the timing. The engine delivers 57 kW (77 bhp) at 6000 rpm, and peak torque of 115 Nm at 3000 rpm. 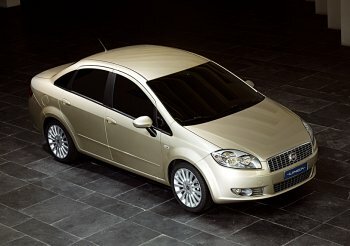 With this engine, the Fiat Linea has a top speed of 165 km/h, and accelerates from 0 to 100 km/h in 14.6 seconds. Consumption is among the best in this class: 8.2 l/100 km in the urban cycle, 5.1 l/100 km out of town and 6.3 l/100 km in the combined cycle. A sparkling engine that is sparing on fuel. This has been achieved by the adoption of an electronic throttle valve control system known as ‘drive by wire’, and of a new high turbulence combustion chamber, combined with continuous variable valve timing governed by the control unit. This innovative system allows a consistent part of the exhaust gases (about 25%) to be ‘recirculated’ in the combustion chamber, significantly reducing fuel consumption and exhaust emissions when driving with a partial load. The engine also proposes a number of features designed to reduce consumption. For example, the timing components have been made lighter and the valve springs are of the low load type, to reduce friction. Another feature peculiar to the new 77 bhp 1.4 engine are the increased compression ratio (11:1) and the high torque values at low speeds, characteristics that make it possible to limit fuel consumption. This target was made possible by the calibration of the latest generation engine control unit, which keeps fuel consumption very low, compatible with the demand for drivability, performance and emissions. We should underline that the 77 bhp 1.4 Fire engine is in line with Euro 4 legislation, with a catalytic converter positioned in the engine bay (and welded to the exhaust manifold flange using a new technology) which reaches very high temperatures faster, thus reducing emissions even while the engine is warming up. To minimise the environmental impact, the engine also incorporates a returnless fuel supply system, which eliminates fuel recirculation within the tank, thus reducing vapour formation. High performance, sparing on fuel and clean: to these winning features the 77 bhp 1.4 Fire engine also adds excellent acoustic comfort, underlined by the adoption of a flexible flywheel which minimises the vibration transferred from the engine to the bodyshell. The Fiat Linea range would not be complete without the 1.3 16v Multijet engine, the smallest and most advanced second generation direct injection Common rail diesel unit, this time with an absolute novelty: a new version with a variable geometry turbo. This version of the 1.3 16v Multijet delivers 90 bhp (66 kW at 4000 rpm) and torque of 200 Nm at 1750 rpm. That is not all. With the 90 bhp 1.3 Multijet, the Fiat Linea guarantees excellent performance: it has a top speed of 170 km/h and accelerates from 0 to 100 km/h in 13.8 seconds. Fuel consumption is also among the best for this segment: 6.5 l/100 km in the urban cycle, 4.0 l/100 km out of town and 4.9 l/100 km in the combined cycle. In addition to the different turbo, other changes have been made to the new engine. The combustion system has been modified, increasing the permeability of the inlet and exhaust manifolds, reducing the turbulence in the combustion chamber and consequently modifying the geometry and the compression ratio from 18:1 to 17.6:1. The emissions control system envisages an EGR valve with electrical activation, managed directly by the engine control system, a heat exchanger to cool the recirculating exhaust gases (EGR) and a close coupled catalytic converter. This guarantees that the car meets the EEC STAGE 4 emissions targets. The 90 bhp 1.3 16v Multijet is a straight-4 engine with a capacity of 1248 cc, a bore of 69.6 mm and a ‘long’ stroke of 82 mm. There are four valves per cylinder, governed directly by a twin overhead camshaft via rocker fingers with rollers. That is not all. The 1.3 Multijet 16v is a miniature masterpiece: ‘dressed’ with all its accessories, it weighs just 130 kg, it is small, just 50 cm long and 65 cm tall, and the component layout was designed to take up as little space as possible. Designed by criteria of maximum rationality, efficiency and reliability, the engine guarantees excellent efficiency and is practically ‘for life’: it was designed to travel 250,000 km without needing any maintenance to the mechanical components. Oil change intervals have also been extended, from 20,000 to 30,000 km, and the 1.3 Multijet 16v uses a low viscosity oil, which means fuel economy and more respect for the environment. The compact, sophisticated engine is also environment-friendly, and it meets the Euro 4 emissions limits even without a particulate trap. The 90 bhp 1.3 Multijet 16v therefore represents a technological leap forward which, for the customer, translates into lower consumption and emissions, without even taking into consideration the reduction in noise (due to the multiple injections), the increase in comfort (fewer alternating masses means less vibration), the smooth, responsive steering (due to the extremely smooth torque delivery, which is guaranteed by the improved combustion control), the elasticity and prompt response of a diesel that resembles a petrol engine for the vast excursion in the number of revs (for example, you are no longer aware of the fuel ‘cut-out’ just above 4000 rpm), or the ecological elements that enhance the diesel’s main environmental credentials (consumption) which minimise its main defect (particulate emissions).